While fans still have a few more weeks until Captain America: Civil War hits theaters on May 6, Marvel is hosting the world premiere tonight in Hollywood at the Dolby Theatre. Thankfully, you don't have to be a VIP to get in on all the action, since Marvel YouTube is hosting a live stream of the premiere festivities. The live stream starts at 5:30 PM PT, and you can be part of the festivities by using the #CaptainAmerica and #CaptainAmericaPremiere hashtags, following @CaptainAmerica on Twitter and liking Marvel's Captain America Facebook page. Sponsored by Comicave Studios, this live event will get you up close and personal with the cast of Captain America: Civil War like no one else can! Co-Hosted by Marvel.com's Tamara Krinsky and Lorraine Cink, this live stream will let you hear from some of the biggest names in the biz. 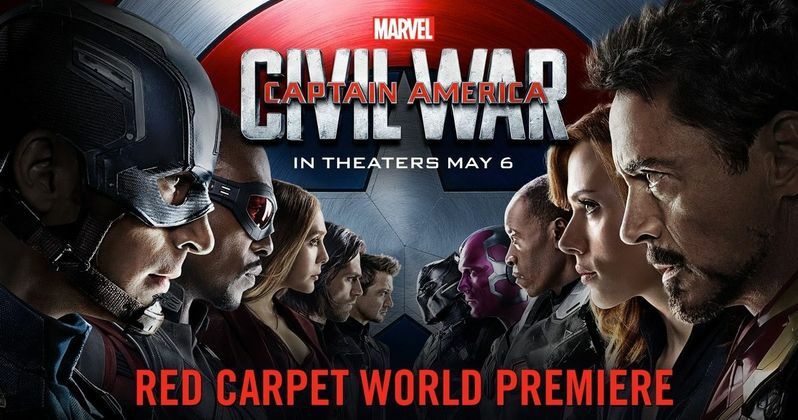 Marvel-ous stars such as Chris Evans, Robert Downey Jr., Scarlett Johansson, Chadwick Boseman, Sebastian Stan, Anthony Mackie, Paul Rudd, Elizabeth Olsen, Jeremy Renner, Paul Bettany, Don Cheadle and many more are scheduled to appear on the red carpet, so you won't want to miss this event! Marvel's Captain America: Civil War finds Steve Rogers leading the newly formed team of Avengers in their continued efforts to safeguard humanity. But after another incident involving the Avengers results in collateral damage, political pressure mounts to install a system of accountability, headed by a governing body to oversee and direct the team. The new status quo fractures the Avengers, resulting in two camps, one led by Steve Rogers and his desire for the Avengers to remain free to defend humanity without government interference, and the other following Tony Stark's surprising decision to support government oversight and accountability. Team Iron Man includes Tony Stark (Robert Downey Jr.), Black Widow (Scarlett Johansson), Vision (Paul Bettany), War Machine (Don Cheadle) and the new character T'challa (Chadwick Boseman), who will make his debut in this movie before starring in Black Panther, set for release on February 16, 2018. Team Cap includes Captain America (Chris Evans), The Falcon (Anthony Mackie), Scarlet Witch (Elizabeth Olsen), Hawkeye (Jeremy Renner), Ant-Man (Paul Rudd) and The Winter Soldier (Sebastian Stan). Marvel's Captain America: Civil War also stars Frank Grillo as Crossbones, William Hurt as Thaddeus Ross, Daniel Brühl as the villainous Baron Zemo and Tom Holland as Spider-Man. Anthony Russo & Joe Russo are directing with Kevin Feige producing. Louis D'Esposito, Alan Fine, Victoria Alonso, Patricia Whitcher, Nate Moore and Stan Lee are the executive producers. The screenplay is by Christopher Markus & Stephen McFeely. Get ready to pick a side and join the nonstop action playing out on two fronts when Marvel's Captain America: Civil War opens in U.S. theaters on May 6, 2016. Click on the video player below to watch the Captain America: Civil War premiere's live stream, which starts at 5:30 PM PT.